Masha is a three-year-old girl who lives in Russia. Every three months, she comes to Hadassah for an oncological examination under full anesthesia. On this particular day, Masha, who sat in the play area with her mother, was very nervous and agitated. She began to cry and shout at her mother in Russian and I couldn’t understand a word. Masha angrily threw a painting in the trash. I took it out, cut a small heart, and placed it on the table. The quarrel stopped. Masha rejoiced for a moment, smiled at me, and took my heart. The nurse called us, and we walked toward the operating room. Halfway there, Masha said to her mother in Russian, “I do not want to, I do not want to, I do not want to!” And she began to cry. Masha’s mother tried to calm her with caresses and words. They continued slowly down the corridor until Masha stopped and started crying again. Her mother tried to calm her down once more. Nurses came out of the rooms because of the racket. Most of them can speak Russian and they tried to get through to Masha, but the crying only grew louder. Masha started to retreat. At first, her mother followed her and then she stopped in the middle of the corridor. Masha walked toward the exit and then stood there in the corner. It was quiet at that moment. All the nurses stood there; they did not know what to do. Her mother tried to talk to Masha again. I felt I had to act. I wanted to reconcile Masha and her mother. I began to walk toward Masha and saw that she was shrinking with fear, so I turned into one of the rooms. 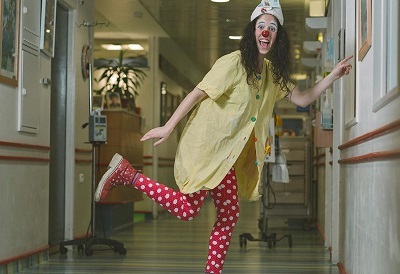 As a medical clown, I had a different goal. I began to look for something, although I did not know exactly what. From the corner of my eye, I saw that Masha was looking at me. I must have intrigued her, or maybe she felt the same way I did: she was looking for something she could not put into words. I remembered that in the waiting room, she was pleased by the heart shape I cut and gave to her. Then I noticed that, luckily, the cardboard and scissors were still in my hand. I cut out a heart and let it fall from my hand right next to Masha. And then I kept walking away to give her the chance to take the next step. I saw from the corner of my eye that she picked up the heart. Yay! She joined in the game. For a moment there, it seemed as if it wasn’t possible, but apparently, she had a reason and a desire to participate. I kept cutting hearts and dropping them to the floor and Masha continued to follow me toward the operating room, collecting the hearts until we reached the middle of the corridor, where her mother was waiting.